Some of our adorable adoptable pups! Join us as we hang out with our friends at Pet Valu in Emerson, NJ to celebrate National Pet Adoption Weekend! There will be a photo booth for you to take pics with your pooches, adoptable dogs and lots of Good Karma Merchandise! 2018 Super Pet Expo Edison is April 13-15 at the Edison Convention Center! Good Karma Dog Rescue will be in Booth #511 (a double booth) with adoptable dogs, lots of merchandise, foster and adoption applications, microchips, and more! Our dogs are always amazing and expo-behaved! We posted the link for tickets because they cannot be purchased through us! We will be there from 3pm Friday until 6pm Sunday make sure to come see us and our pups! Come join us at Pet Valu in Emerson, NJ on Saturday, march 24th from 11-4! Meet Hadley, Hawke, Hannah and a few other surprise guests. Good Karma merchandise will be available for purchase. Join us at the Super Pet Expo in Edison, NJ - February 10th-12th. We will be in Booth 515! Northern NJ - Join us tomorrow 11-2 at River Vale Day! River Vale is the birthplace of Good Karma Dog Rescue and we are honored to be part of such a special event! 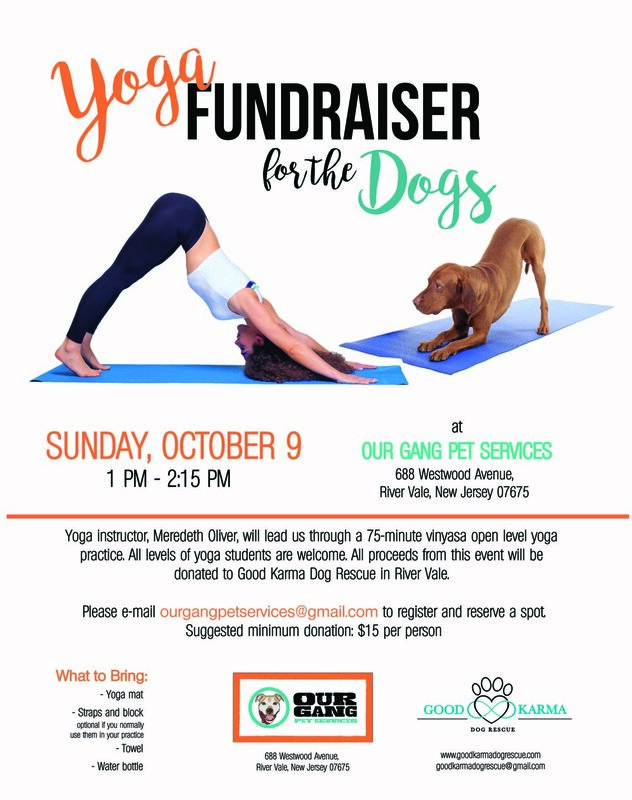 Yoga Instructor, Meredeth Oliver, will lead us through a 75 minute vinyasa open level yoga practice at Our Gang Pet Services in River Vale. All levels of yoga students are welcome. Come and get your zen on! Join us at the Passaic County's first annual Paws in the Park event on Saturday, October 8th at Goffle Brook Park in Hawthorne, NJ. There will be tons of activities for the WHOLE family including dog costume contests, face painting, food trucks and more! Join us for one of the biggest events of the year! Come see us at Emerson Animal Hospital (371 Kinderkamack Rd. Emerson, NJ) on Sunday, June 12th! Come meet puppies & dogs of all shapes/sizes that are up for adoption! Donation Collections: Food, crates, blankets, newspapers, etc. Please join us and help support the Skyline Lake Volunteer Fire Department at the 11th Annual Indoor / Outdoor Craft & Vendor Show & Pet Adoption. Over 60 vendors / crafters/ pet rescue groups last year with a great selection of wedding, Communion, graduation, and Spring gifts! Free parking with a large level parking lot. "Invite" your friends, give us a “Like” and "share", Thanks! You can also check out www.skylinelakefire.com and click on “events” or call (973) 835-4797. Ladies' Night Including Drinks, Food & Pampering! Together with Rodan + Fields, GKDR presents our first Ladies' Night at River Vale Country Club! Proceeds will benefit Good Karma Dog Rescue. Ticket price includes 15 minute facials, appetizers, wine and beer! Please RSVP to goodkarmafundraising@gmail.com if you'd like to attend. The price is $45 when you RSVP in advance, $50 at the door. *Please note, that we can not promise that we will be able to accommodate walk-ins.